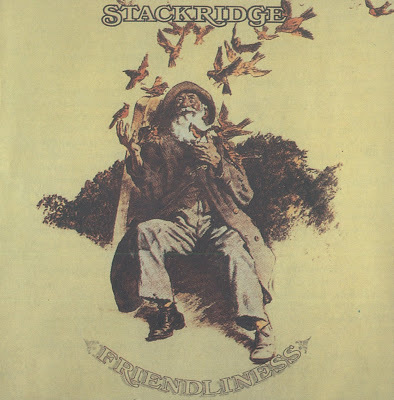 Stackridge emerged from the Bristol folk scene and their first two albums were folk-rock characterised by songs about strange characters/mythical beasts and instrumentals - threads that remained with them and which appear on all their albums. On their debut, Stackridge, highlights were Slark, a ten-minute extravaganza about a mythical monster which perhaps extends a nod towards Greig's Norwegian dances and which was the cornerstone of their initial stage act, Dora The Female Explorer, a lively harmonica driven piece and The Three Legged Table, a mixture of acoustic and soft rock that works very well. Other tracks told the story of Percy the Penguin who had cucumber wings and who unfortunately came to a sticky end, and Marco Plod, the 'strangest man alive today', whose caricature was issued in badge form to members of the Stackridge Fan Club. Their second effort, Friendliness, continued in the same vein with Syracuse The Elephant (born and bred in Bristol Zoo, brought up on swedes, his keeper was a specialist who came down from Leeds), Amazingly Agnes, a reggae tune about a cow, a Charleston-type number entitled Anyone For Tennis featured Pigsty Hill Light Orchestra's assistance and a song about factory farming established Keep On Clucking, which for Stackridge was quite a rocky number. It also featured the instrumental Lummy Days, which opened many a show. The Man In The Bowler Hat was Stackridge's attempt at serious music although it still had at its basis amusing story lyrics. George Martin produced it and it's probably their strongest album musically. Unfortunately it precipitated a split, as what was essentially a good time live folk-rock act full of dustbin lids, rhubarb thrashing antics (eat your heart out, Morrissey) and jokey tunes tried to become serious rock musicians. The Last Plimsoul is probably the best track but Road To Venezuela, The Galloping Goucho, and Fundamentally Yours are other highlights of what is a good album, not wholly out of character but definitely a progression from what had gone before. The album was recorded by what was the 'dream team' line-up of Andy Davis, James Warren, Mutter Slater, Mike Evans, 'Crun' Walter and Billy Sparkle. The band split almost immediately after and the USA version of the album has a different title, different track listings and shows pictures of different personnel. Extravaganza was their first album for Elton John's Rocket label. If anything the instructions to the new members of the group seem to have been "Let's go back to the good-time feel of previous albums". The Volunteer, a track left over from the Man In The Bowler Hat sessions is one of the strongest and there are several examples of Rod Bowkett's influence - particularly strong are the instrumentals Pocket Billiards and Who's That Up There With Bill Stokes?. Benjamin's Giant Onion has an old Stackridge feel about it and the band also recorded a version of Gordon Haskell's No One's More Important Than The Earthworm (which they performed on the 'Old Grey Whistle Test'). The US version included Do The Stanley, a single previously released around the time of The Man In The Bowler Hat, a new dance inspired by Stan Laurel apparently! There is no doubt however that Extravaganza suffered as a result of James Warren's departure. Mr Mick was an ill-fated attempt at a concept album. In truth the material was weak, opening with a Beatles cover version (Hold Me Tight), the best material being the instrumentals, one of which, Coniston Water, is quite good. By this time the band had lost the plot. Only Andy Davis seemed to have any real creative force left. Warren had long since departed and Rod Bowkett did not appear on this album either. Time for bed, said Zebedee!! Do The Stanley (which refers to Stan Laurel) is a good compilation as it shows the band at their best (on record at least as really they were always better live than on record.). It contains a few single 'B' sides which are rather good, particularly the instrumental Purple Spaceship Over Yattan. Most of the music is from 1971-1974 with the 'dream team' line-up. Let There Be Lids, the Mike Evans led violin assault, is featured and is not available elsewhere. Recommended as an initial 'taster'. Davis, who had played guitar on John Lennon's Imagine album, made a solo album in the late eighties/early nineties entitled Clevedon Pier on the MMC label - it was 'new age' in style. He also toured with Tears For Fears. Mutter Slater resurfaced in 1983 in a pub-rock band called Rave To The Grave, who recorded an album. He was no longer playing the flute, but did write a lot of material for the album. Mike Evans went on to join the trio of musicians who played at the Bath Pump Rooms and eventually sued the proprietors for wrongful dismissal!